Our September volunteer of the month is fisheries and aquaculture expert Dr. Joe Sullivan. 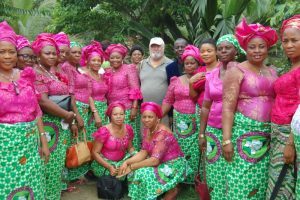 Joe served in the Peace Corps as a Fisheries Extension Agent in Zambia after retiring from the Alaska Department of Fish and Game, fulfilling a lifelong dream. 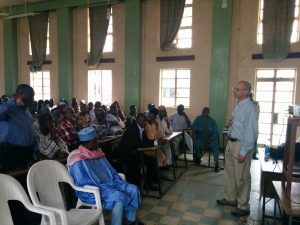 Since then, he has volunteered several times with Winrock’s USAID-funded Farmer-to-Farmer (F2F) program, completing two volunteer assignments for Winrock this year alone. 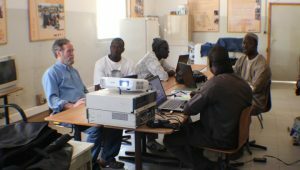 His volunteer service for Winrock since 2002 has taken him to Bangladesh, Kyrgyzstan, Tajikistan, Nigeria, Mali, and Senegal. 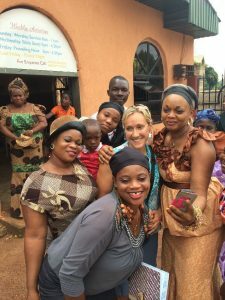 During his most recent assignment in Nigeria, Joe worked with the Nigeria Cooperative Women Alliance (NICOWA), an all-female organization set up to assist women from all works of life to engage in productive ventures and attain self-reliance. 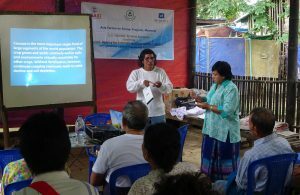 NICOWA requested support from a F2F volunteer to provide training-of-trainers in catfish fingerlings production to a select group of its members who will go on to train other members of this group. Joe trained more than 100 women. 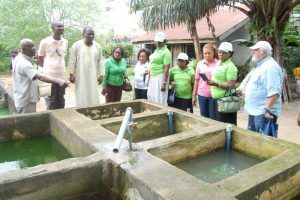 He found NICOWA to be a well-organized cooperative with enthusiastic members dedicated to solving their problem of access to catfish fingerlings for their growers. Joe is a very passionate fisheries and aquaculture expert. During his recent assignment in Nigeria, he was unable to return to the fish farm in the evening to inject the fish with hormones so that the catfish could spawn the next morning. Therefore, he took a couple of catfish in plastic tubs back to his hotel room so he could inject them in the evening. During the night, the catfish jumped out of the plastic tubs and were walking around the bathroom! Fortunately, Joe knows how to handle catfish. After so many volunteer experiences around the globe, what inspires Joe to keep volunteering? Thank you for your great work, commitment, and service, Joe! How do you feed 7 billion people? Teach Ag! The National Teach Ag Campaign reminds us of the importance of agriculture worldwide. National Teach Ag Day (today, September 24) recognizes the women and men who are engaged in providing agriculture education and training, and who inspire others to consider or expand their careers in the agriculture sector. 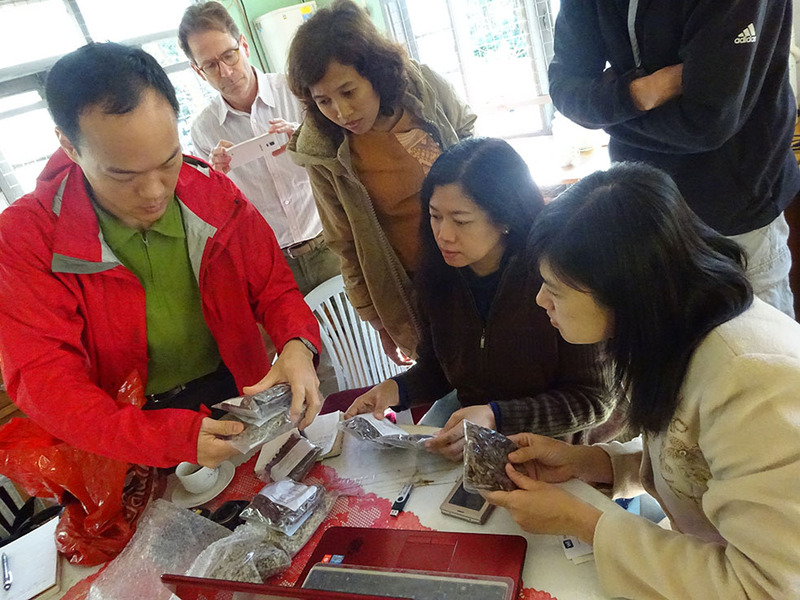 Winrock is proud to be engaged with so many wonderful ag teachers, through our USAID-funded Farmer-to-Farmer program. Enjoy these photos of some of them in action around the world! 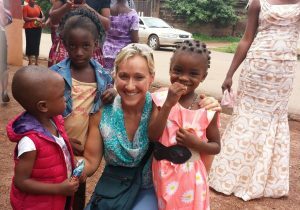 “It has been nearly 2 months since I returned from my assignment to Nigeria. This was my first volunteer assignment with Winrock, or any other organization for that matter. 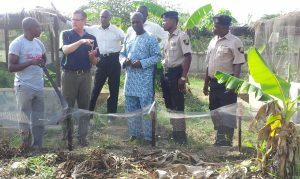 The assignment was a curriculum assessment of a small agricultural college in Abakaliki, Ebonyi State, Nigeria. I was an assistant to the associate head of my department on this trip. It was amazing. I know that I cannot capture the full experience of the trip in words but hopefully I can come up with some of the essence. I am not new to traveling but admittedly it had been a while since I’d traveled to a developing country. This trip was an excellent reminder of how much I enjoy getting off the beaten path and experiencing real life in these countries. Abakaliki is by no means a tourist destination and it became apparent that we were the first Caucasians that many of these people had ever seen. So no, there were no wild animal safaris or ancient ruins to tour but what there were was real people, simply living their lives and doing the best they can for themselves, and they were warm and friendly and welcoming of us into their town. Umuebe Farms College is a new, 2-year agricultural technology program that takes place on an established, working farm. 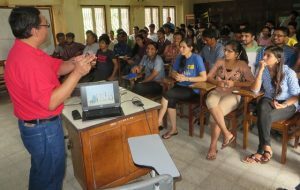 The idea is that students can earn a 2 year technical degree and enter the workforce with employable, practical skills. Our job was to work with the college to do a full institutional assessment of the curriculum, administration and help them to increase enrollment. I loved touring and learning about the farm. Although it is small by American standards, it was in excellent condition. All labor is being done by hand but the animals, crops and production were in great shape. On the day we toured, there were some Animal Science students from the local University visiting to gain field experience. I especially enjoyed meeting two young women, who were Seniors, and telling them that I was also an Animal Science graduate, from the other side of the world. 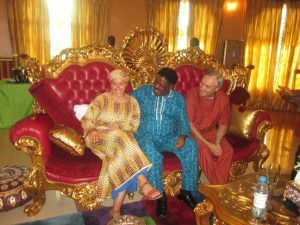 As part of process of gathering information on the local industry and what employers are looking for, we spent a day in Enugu City, the capital of Enugu state and about an hour from Abakaliki, talking to some local business owners. I really enjoyed meeting these owners of small businesses and hearing their story of how they got to where they are. My family owns a small business, so it touched a personal note to hear how these guys started out with nothing and through hard work were able to build their companies into thriving and profitable businesses, which is not unlike the story of my own father. Our time in Abakaliki was capped off with a formal presentation of our findings to the administration and owner of the college and then a huge send-off party that they threw us. There is no way I can communicate how special it is for people that do not have hardly anything, to make such an effort for us. It simply goes to show how giving a society can be, even if it is not a wealthy society. The party was a great time for everyone. 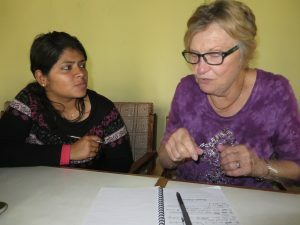 I had a wonderful volunteer experience in Nepal. This was my first time to Asia, and I was amazed with the amount of human activity at every turn in Kathmandu. Every conceivable form of transportation seems to be used in Nepal, from motor bikes, rickshaws, water buffalo & cart, horse & cart, bicycles, tractors and automobiles. I am glad I didn’t have to drive here with no traffic lights and driving on the left hand side of the road. I was so surprised how the cows would just lay in the middle of the road without a concern in the world. My assignment was to improve goat productivity in Nepal through the use of the FAMACHA card. 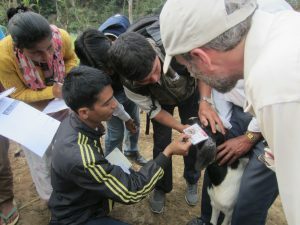 The FAMACHA card is a technique used to detect the level of internal parasite infestation in sheep and goats by evaluating the lower eyelid for signs of anemia. 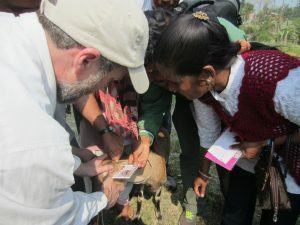 The learning went both ways, as I learned about goat production in Nepal, and participants learned about improved goat production techniques. 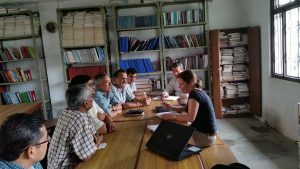 We held the trainings with the Agriculture and Food Security Project (AFSP), Nepal Junior Technicians, equivalent to our county extension agents in America, in classroom settings and in the field on farms. 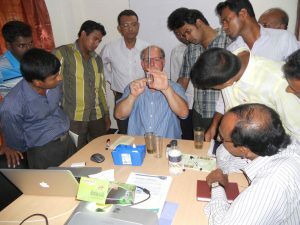 I found the in-field experience was very beneficial to the participants. They eagerly implemented what was taught in the classroom. 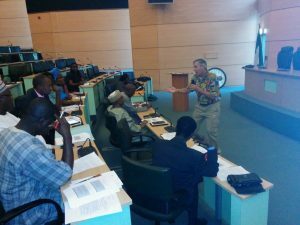 The practical application of the theory learned in the classroom was reinforced in the field through demonstration of goat best management practices. I especially enjoyed our visits to the Village Development Committees (VDCs). 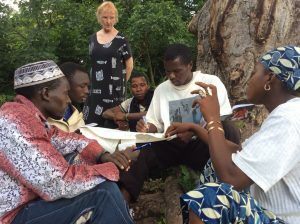 These are groups of farmers that work cooperatively together to improve farming productivity in their region. 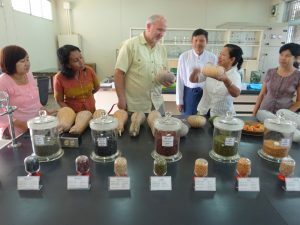 The farmers treated me as an honored guest at each of these farming communities. I was welcomed into their community where we were always fed a delicious meal after our in field training. They were so warm and hospitable. I even had the honor of having the Tika red mark placed on my forehead, a sign of honor and blessing. I would like to thank each of the farmers from the VDCs who provided their goats for the junior technicians to practice with their FAMACHA cards and weighing tapes. I would also like to take this opportunity to thank my host Shiva Prakash Acharya from the AFSP, Nepal and Krishna Prasad Rijal from FAO. They did a yeoman’s job in organizing the trainings and farm visits to the VDCs. 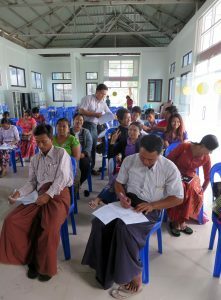 Their organization made the trainings a huge success. Lastly, without the assistance of the Nepal Winrock local staff, this rewarding and wonderful experience would not have been possible. 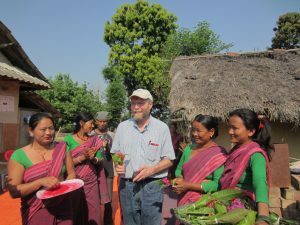 They made me feel most welcome and did everything you could imagine to help me adjust to the Nepal culture & environment. 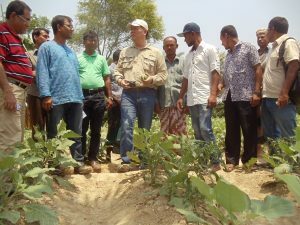 Today’s blog entry comes from Dr. Bill Daniels from Auburn University, who recently completed a Farmer-to-Farmer volunteer assignment in Bangladesh. “Bangladesh is a lush, green tropical country, at least during the rainy season, and the delta region has water everywhere. It is not surprising that it is the 5th largest producer of aquaculture products, but it could produce so much more. Its people and culture are also most hospitable and welcoming to the outsider. Despite the language barrier, people went out of their way to make the visit enjoyable. According to the Department of Fisheries, aquaculture and fisheries provide employment of 17 million people in Bangladesh, 60% of animal protein supply and 650 million US$ export earnings per year. It has 10 million hectares of rice fields with an additional 2.8 million hectares of seasonal rice fields where water remain 4-6 months (BRKB 2010). In 2014, fish production reached 3.5 million metric tons. Despite the lush conditions of Bangladesh, the intensity of aquaculture production is relatively low compared to other Asian countries. In Bangladesh, aquaculture production is mainly extensive and the production rate is comparatively low. For example, shrimp yield is only 200-300 kg/ha/year. Freshwater prawn (Golda) production in Bangladesh (and also in Myanmar –where I completed another F2F assignment earlier this year) is hampered by the lack of hatchery-reared post-larvae for pond stocking and has to be supplemented with wild-caught post-larvae and juveniles. Despite the numerous existing hatcheries, most of these are not producing because of continued failure to consistently produce larvae leading to high financial losses. My assignment focused on evaluating the cause of prawn larval mortalities and training in proper hatchery management to reduce losses. 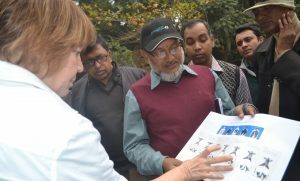 This work focused on working with the Bangladesh Fisheries Research Institute’s Shrimp Research Center in Bagerhat located near the area where freshwater prawns are grown and marketed. Through its staff and scientists, we were able to convert an existing system (water exchange based) into a closed recirculating system to provide better water quality and solids removal along with better biosecurity and daily hatchery management.